It got so bad, her management now screens her tweets to make sure they're kosher. When Twitter first came out, everyone struggled to find the balance between sharing bits and pieces of their day and oversharing every aspect of their lives. Although her team does post the tweets, Adele notes that all the content that appears on her Twitter is her own. She states, “they’re all my tweets. No one writes my tweets. They just post them for me.” Not to worry, Adele, many of us could benefit from a second pair of eyes determining what exactly is tweetable and what isn’t. 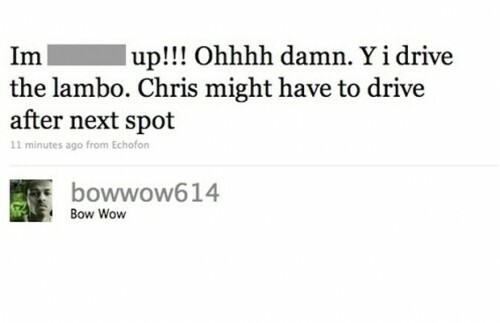 Back in 2010, Bow Wow posted a string of drunk tweets illustrating just how intoxicated he was one New Years Eve while driving. Although the tweets were ultimately deleted, Bow Wow took to his Twitter the next morning to apologize for his stupidity.